Anthem isn't beyond redemption. At least, I don't believe that it is. Of course, I wouldn't blame you for thinking or feeling otherwise. We are now six weeks out from the launch of Anthem, and its abundant issues have been well documented and catalogued. They range from incidental, to game breaking, to genuinely baffling. To be honest, to recount each and every one of them here for you today would be an exhausting exercise. BioWare has firmly stated that it is dedicated to improving the current experience and realising the long-term potential of Anthem – a future for the game that it had envisioned so many years ago. At this rate, however, a problem that the studio is going to face will be a direct result of the perception that players are forming of the game right now. While I believe that Anthem can be saved, I worry that some players might lose sight of why it ought to be. Sometimes, it's hard to see the forest for the trees. Given how complex and creatively challenging making any piece of interactive entertainment has become in the modern era, perhaps it will come as no surprise to you that many developers do truly believe that getting a game – like, literally any game – to market is something of a miracle. Then again, if you're one of the millions of players out there that spent $60 on Anthem at launch expecting one thing only to receive another entirely, perhaps you don't care all that much about miracles anymore. People make games and games are played by people. I can see it from both sides, and this situation clearly isn't great for anybody that has any type of investment in it. And, truthfully, BioWare has a lot of ground to cover to get Anthem where it needs to be. The studio needs to reexamine the core structure of the game; the mission variety and design desperately need improving, and the cracks in the progression systems need to be patched over before it breaks apart (again). This, I believe, will all come in time. "There is a precedent set for this, after all. Just look at what BioWare Austin managed with Star Wars: The Old Republic or what Zenimax was able to achieve with The Elder Scrolls Online." There is a precedent set for this, after all. Just look at what BioWare Austin managed with Star Wars: The Old Republic or what Zenimax was able to achieve with The Elder Scrolls Online when it had a little time. How about Bungie pulling Destiny back from the brink with The Taken King or Square Enix doing the same with Final Fantasy 14 and A Realm Reborn. Ubisoft kept the likes of For Honor, Rainbow Six Siege and The Division on life support before massively turning them around through smart deployment of resources. The question now is whether BioWare can start pushing Anthem in the right direction before it's too late. It doesn't have the same patience or trust that many games before it were lucky enough to receive (there's a reason for that, and we'll get there in due course). I believe that Anthem can be saved - that BioWare can get it where it needs to be, where it deserves to be. And It would do us all good to take a step back and remember where exactly the studio is trying to take Anthem, and the type of experience it could be given the time. Who better to help us with that than BioWare general manager Casey Hudson. Just a week out from the launch of Anthem I sat down with Hudson. We spoke at length about where the game had come from and where it was going next, how BioWare was crafting an ever-evolving world built for science-fiction storytelling. At the time, as the extent of the issues with the game were being born out in GamesRadar's Anthem review and by reports from the community, it painted a picture of a studio and game in disarray. The interview didn't run – Anthem could speak for itself and what it was saying wasn't particularly pretty. Now, six weeks out from the storm that was Anthem's launch, I'm glad that we made that call because it has given us the opportunity to return to that interview and look at Hudson's comments with fresh eyes. A little perspective is a beautiful thing. For Hudson, the spark of inspiration that helped BioWare form its earliest ideas of what Anthem could be was in watching America react in realtime to Hurricane Sandy making landfall in late 2012. "It built and built in the headlines over a number of days; people knew it was heading towards the East Coast for a long time and all we could do was watch as the warnings about how bad it was going to be ratcheted up. And then, on the day that it hit…" a pause, and then a sigh. On the day it hit, Casey found himself consumed by the chaos as it unfolded in real time. Millions of us did exactly the same. As morose as it may be, the storm of the century arrested our attention like nothing else. It wasn't the sheer terror it evoked that caught us all though, but the unpredictable nature of it. The weather reacting unusually, cities crumbling at their foundation and threatening to collapse at any moment, and communities rallying together in ways that were as surprising as they were selfless, all in an effort to survive something that could not be stopped or reasoned with. Like all acts of nature, it had to be endured. Once the storm had subsided, an idea began to gestate in Casey's mind: "What if a game world was like this?" "You would have something to talk about with other players, but it wouldn't just be about what you did in the game or about something in the storyline that you don't really want to spoil for others. You would, in fact, be able to talk about the world as though it was a real place – you'd have to react in real time because something was happening right now, because there's a storm coming and it can't be stopped. If something like that happened the night before and you heard people talking about it after, and of course you're going to wonder what could come next." In doing this, Hudson continues, Anthem would offer a constant challenge and stream of content for players to interact with and navigate. "That was a big part of it for us. We have been trying to design a world that is meant to change and constantly do different things. Normally, the approach to an open world is that we create a vast amount of square footage and the square footage is the content that you consume. Once you've been everywhere, then that's it – you've consumed it all. What if the world itself was constantly changing – if it was always telling you a story and always evolving – and therefore you couldn't just consume it? That was [a challenge] we were trying to solve for with Anthem." "We have been trying to design a world that is meant to change and constantly do different things." It's fascinating to hear Hudson talk about Anthem in this way, so close to launch – to reflect on it just a couple of weeks later. Because it's clear for all to see that this vision is not wholly present in the live game as it exists today. Sure, BioWare has the capacity to introduce treacherous storms when it wants – to add hordes of enemies to its open world to reflect the shifting weather patterns – to a certain extent, but we certainly haven't seen it activated to the scale that Hudson believes Anthem is truly capable of. So close to launch, he would have known that was the case. And I find this fascinating because it doesn't just sound aspirational to me, it seems plausible. Like it's something BioWare could do in the future, provided it weathers the storm it's currently caught in. There's something else here that piqued my interest though. As you may or may not know, Casey Hudson left BioWare in 2014 – as Anthem was in its earliest stages of development – only to return in 2017, as Anthem would enter a period of accelerated production in an effort to hit its release date. Upon his return, he would find that Anthem had drastically changed shape from the one he had helped initially incubate. This is all recounted in Kotaku's account of Anthem's tumultuous development. So much of Anthem has changed since its earliest days. The Kotaku article makes it sound as if most of the ideas that existed pre-2014 are dead and buried. And yet, this all sounds eerily close to what Hudson was telling me of Anthem just a week out from launch. And you have to remember, Casey Hudson is the General Manager of BioWare – he can craft whatever narrative he wants. When I ask about the origins of Anthem or how he wants the world to work over time, he is inclined to reply with something that can be at once reflective and aspirational. In telling the story about Hurricane Sandy, and a game world that would forever warp around the player, it wouldn't be in his best interest to paint a picture that he didn't believe BioWare was capable of delivering. Hudson is clinging onto this part of the original vision of Anthem where so much of it has fallen. If I were being cynical, I would say, 'who cares, fix the game'. Were I being curious, well, I'd have to question whether this was something to come on the near horizon. Anthem may have changed dramatically in the time that Hudson was absent from BioWare, but I get the sense that he truly does believe that a kernel of that original vision is still there in some form. He is, after all, speaking about it for a reason. And I have to tell you, folks – I'm feeling pretty damn curious. Honestly, one of the most excellent parts of this job is getting to speak with the people at work behind the pixels and polygons at various stages throughout production. The best interviews will give a fascinating insight into the trials and tribulations of the creative process; the worst are exercises in frustration. Something you learn quickly in this line of work is that different developers are afforded different degrees of freedom to discuss the particulars. EA (like many of the triple-A publishers out there) has a tendency to media train its designated spokespeople to the nth degree. The personnel a publisher puts in front of us have a tendency to be masters of the company line, experts at steering a conversation back to audience-tested anecdotes and workshopped points of interest no matter how far off the rails it may go. Back in 2016, you could have asked a representative of DICE what they'd had for breakfast that morning, and they would still find a way to frame their bacon and eggs around how Battlefield 1 was going back "to the dawn of all-out-warfare". Honestly, it's kind of impressive. "You could have asked a representative of DICE what they'd had for breakfast that morning, and they would still find a way to frame their bacon and eggs around how Battlefield 1 was going back "to the dawn of all-out-warfare." That's why I found speaking to Casey Hudson, just weeks out before the launch of Anthem, to be so refreshing. While there were no PR representatives on the end of the line, I've been doing this long enough to know that the general manager of BioWare knows precisely what he can and cannot say. 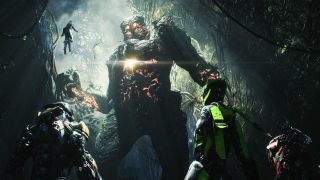 What surprised me then, is that when presented with the opportunity to dabble in a little revisionist history – or, at the very least, damage mitigation – Hudson was steadfast in his hope for how Anthem would take shape in the future, openly discussing how BioWare would deliver this reactive world that could constantly reshape the player's journey. "We'll be changing the overworld in terms of how it looks, not just the time of day or the weather. There are different ways that we can really change what's going on in the world," Hudson tells me in that interview ahead of Anthem's launch. "From the way that it looks to the way that you can play in it, to the creatures and enemies that you encounter – all as a part of this big narrative that will change over time." "There's a spectrum of different kinds of content that we [will] constantly be updating," Hudson continued. "There are things that will happen on a daily and weekly basis, and then there are the larger storylines that will build to the world changing." This will be reflected in the world and in Fort Tarsis in a number of ways, Hudson said. From "ambient dialogue lines" that are added to existing characters or finding "notes for your codex around town" to contextualise and reflect events as they kick into gear, to some much heavier content drops as BioWare really ramps up the chaos in Anthem's world. "For our big narrative storylines that will run through the live service, then you get up into these big showpiece moments. That's when [we] then have to do some more expensive and work-intensive performance capture and things like that." He noted that BioWare was still exploring that spectrum. That the big, expensive showpiece moments that the studio has proven itself so adept at over the years isn't the only way that it can tell a story now – that it's still exploring and experimenting with what it can do through Anthem in this regard. "It's our job to make sure that we're continuing to provide content, features and storytelling so that Anthem is a game that you want to keep coming back to, that you want to keep coming back into this world." There's no doubt that BioWare hasn't yet delivered in that respect. And so the question now is how long will it take BioWare to get there? How long will we, as players, give BioWare to turn this thing around before we turn away from Anthem entirely? As I mentioned right at the top of this feature, in many respects, the problems Anthem is encountering now aren't all that dissimilar to the ones that a legion of other titles bearing the now controversial 'Games as a Service' moniker all experienced in the months following their respective launches. Is there an argument to be made that BioWare should have been better prepared to face the challenges of running a live service given that Destiny helped kicked this thing off five years ago? Absolutely. It is, however, worth bearing in mind that we have the vocabulary (and frames of reference) in 2019 that simply didn't exist in 2014 – we are all in a better position now to discuss and dissect these issues than we have ever been in the past. Back then, the closest point of comparison for Destiny was to the traditional MMO. Would Anthem's launch have been so devastatingly perceived had it been able to get away with being compared to Star Wars: The Old Republic – a BioWare game with its own tale of launch woes and eventual redemption to share – rather than a slew of slick, triple-A action games that have benefited from years of consumer patience, good will and behind-the-scenes iteration? I'm going to go out on a limb here and suggest that were that the case, BioWare would currently be working towards bigger implementing some of the bigger picture goals we've discussed here today rather than dealing almost exclusively in exhaustive damage control. "The thing that people need to understand is that we are fully committed to this game." Either way, I sincerely hope that BioWare is able to get Anthem back on track and I do believe that it can. As players, we've all invested time, money and energy into the game and we want that to be respected by the studio, right? Well, for me, if that means I need to summon a little patience – the same that I gave to Destiny, Warframe, Rainbow Six Siege and countless others – to give BioWare the chance to get this game a little closer to the one it had first envisioned – the one it promised us for so long – then so be it. I'm here for Anthem. Not for the Anthem that exists today, but the one that could exist tomorrow or a year from now. It's coming. It's just going to take some time: "The thing that people need to understand – and I want to make sure that this comes across," Hudson told me in that interview, "is that we are fully committed to this game. It's something that we're going to continue to support it for a long, long time."